UK’s Future Soldier System Gets Defined? Countering deadly improvised explosive devices (IEDs), or roadside bombs, has been a major imperative for US and Coalition forces in Iraq and Afghanistan over the past six years. Radio-initiated, remotely controlled IEDs have received the most attention. The US military has fielded thousands of electronic jammers that block the transmission of radio-frequency signals to prevent those type of IEDs from being detonated by insurgents using cell phones, garage-door openers and other wireless devices. These active jamming systems typically scan for RF signal transmissions across programmed frequency bands or specific frequencies and automatically jam any transmission they detect silently in milliseconds, transparent to the user. The vast preponderance of the jamming systems, nearly 35,000 of which are in use by US Army and Marine Corps units in Iraq and Afghanistan, are vehicle-mounted. They essentially provide a protective “bubble” around convoys, which have been the main target of IED attacks. US forces have fielded far fewer man-portable counter-IED systems for dismounted soldiers, particularly due to the demanding size, weight and power requirements of those systems. They must be much smaller and lighter than vehicle-mounted systems, including a battery pack for power and an antenna, and must provide an effective level of jamming performance – as many watts as possible – without endangering the safety of the soldier carrying the system from the emitted radiation. Vehicle-mounted systems are not constrained by size and weight like dismounted systems and draw on the vehicle’s power instead of batteries to achieve greater jamming power and range. 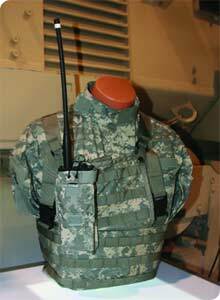 While man-portable systems are typically carried in a backpack, the first to be deployed in Iraq in August 2005 was actually a hand-held system called Warrior Blue, which resembled a “walkie-talkie” radio. Produced by Tyco Electronics, the portable jammer was used by infantrymen on foot patrols or at checkpoints. However, the half-Watt system quickly became obsolete, because it was designed to counter a low-power radio threat and insurgent bomb makers soon moved to more powerful radio triggers. The device also used eight lithium batteries, which required frequent replacement. The first backpack-mounted counter-IED jamming system to be fielded with US Army and Marine forces was the Guardian. More than 1,000 were deployed in Iraq and Afghanistan in 2006-2007. The US Department of Defense procured the systems from BAE Systems, whose principal subcontractor was Finmeccanica subsidiary Selex Communications, which developed and manufactures the Guardian family of man-portable jamming systems. Guardian is a re-programmable jammer with a vertical antenna and features integrated forced-air cooling. It is powered by a lithium-ion battery that can operate for up to four hours. Guardian provides continuous coverage capability from 25 MHz to 2.5 GHz and provides 10 Watts of jamming power, according to Selex. The system can provide either broadband barrage jamming or spot jamming of particular frequencies in its coverage area. The formal name for the US IED jammers is Counter Radio-Controlled IED Electronic Warfare (CREW). CREW 2.1 Combined Vehicle Receiver/Jammer (CVRJ) and Mobile Multi-Band Jammer (MMBJ) systems, produced by ITT Electronic Systems - previously the EDO Corporation, are the latest vehicle-mounted systems being procured for US Army units. The planned CREW 3.2 system also will be vehicle-mounted. The next dismounted system planned for procurement by the US DoD is called CREW 3.1, whose requirements call for improved performance, including longer range, and reduced size and weight compared to Guardian. In December 2007, three US companies – ITT Advanced Engineering and Sciences, Northrop Grumman Mission Systems and Sierra Nevada Corp. – were each awarded a contract to provide seven off-the-shelf CREW 3.1 engineering prototypes for test and evaluation. The DoD planned to award a contract in early 2009 for production of an initial 200 of the new backpack systems with options for 2,300 more. Sierra Nevada delivered the latest version of its Thor backpack jammer family – Thor III – for the CREW 3.1 competition. Its Thor IA system won a US Special Operations Command (SOCOM) competition in mid-2006. The company delivered 161 systems and was awarded a contract to develop an improved Thor II system, which is now in production. According to a company data sheet, Thor IA weighs 6.8 kilograms with its rechargeable lithium-ion battery pack and achieves up to 70 watts of jamming power. Thor IA provides “Band A” coverage, while Thor II, about one kilogram heavier and a little thicker, covers Bands A and B. Due to weight limitations, Thor III features three interchangeable modules that cover Bands A, B and C, respectively, according to a Sierra Nevada representative. He noted that the single biggest challenge in designing man-pack CREW systems is high-power amplifier technology. More efficient amplifiers are needed, he said, to decrease the required battery power and to reduce the heat that is produced by the amplifier that must be dissipated. A representative of Northrop Grumman Mission Systems’ Network Communications Division said that his company’s CREW 3.1 man-portable offering is a derivative of an existing software-defined/programmable radio, which he said would provide a cost advantage due to a higher production volume as well as greater compatibility with US military communications systems compared with a purpose-built jamming system. Looking beyond the CREW 3.1 and 3.2 off-the-shelf systems, the US DoD is set to initiate a long-term development program for a family of more advanced CREW 3.3 jammers with high commonality that would address future dismounted, mounted and fixed-site requirements. Key features of CREW 3.3 will be the use of open-architecture interface standards and an emphasis on software rather than hardware upgrades that will facilitate incremental performance improvements over time as threats evolve. Three leading international producers of anti-IED jammers are Elbit Systems’ Elisra subsidiary and Netline Communications Technologies, both in Israel, and L-3 Communications’ TRL Technology in the UK. Elisra’s EJAB (Electronic Jammer Against Bombs) family of counter-IED jammers, developed in response to Israel Defense Force requirements and proven in combat operations in Lebanon over a number of years, is available in vehicular and portable (suitcase) models. In late 2005, Elisra reported its first overseas sale -- five vehicle-mounted and five portable sets – to the Polish Ministry of Defence for use by Polish Army forces in Iraq. EJAB jammers use separate modules to cover a wide frequency band. 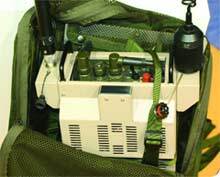 Netline’s C-Guard ManPack is a programmable IED/bomb jammer carried in a backpack. It can be configured to block different frequency bands, from VHF to UHF and higher satellite and cellular phone bandwidths. TRL Technology offers the Broad Shield Tactical Man Pack programmable IED jammer, which can provide simultaneous multiple-target spot jamming in addition to broadband noise jamming and single-spot jamming.